This summer, we were lucky enough to work with the City Of Melville to provide music entertainment for three of their events. A wonderful bunch of people to work with, and well-organised and very well-attended events made for an excellent experience all-round. 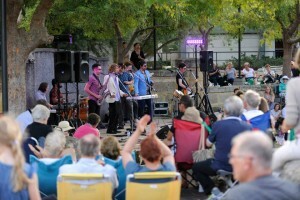 The Melville Limestone Concert series is a long-running event for City of Melville; a season of free concerts held on a Sunday afternoon at the Melville Limestone Amphitheatre. Past years have even featured some of the bands now in our Retro Music Box family: The Darling Buds Of May and The Merindas (click here to check out some photos from the concert). This year’s theme was ‘Take Me Back’, so who better to provide entertainment than Retro Music Box? This year our bands hit the stage for this two of these concerts: Cottontail Trio & The Supper Club showcasing 1930s and 1940s tunes of the Andrews and Boswell Sisters, and Some Like It Yacht taking the audience on a journey back to the 1970s and 80s. The full audiences of both evenings enjoyed beautiful balmy weather with their picnics, and the concerts went off without a hitch, both ending with cheers for encores. 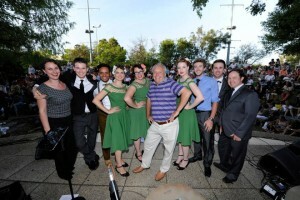 The mayor of Melville, Russell Aubrey, even got in on the action, snapping photos with the bands in their set breaks! Check out more photos of the concerts here and here. 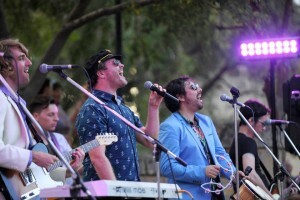 The other main event Retro Music Box were involved in was this year’s Point Walter Concert. 2015 marked the 20th anniversary of this concert, and City Of Melville were keen to make it bigger and better than ever before. 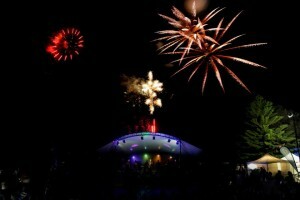 9-piece soul band Stratosfunk were booked to close the show, and they did it with a bang – literally – with a huge firework display right after their final note! The 6000-strong crowd were up dancing from the first song, with people all the way back on the hill getting up to join in with the vintage dance moves. Click here to check out the huge crowd! City Of Melville were so pleased with our efforts and the efforts of our amazing bands that they wrote us some thank you letters – going straight to the pool-room! Stratosfunk were amazing and it was so great to see the crowd up and dancing right up until the end. Loved all the dance moves and interaction between the girls and the crowd. It was absolutely perfect for the family vibe of the event. Such a talented bunch of musicians. I have no idea how I’m going to top that next year! Make sure you sign up to our mailing list so we can let you know about more 2015 / 2016 outdoor concerts that Retro Music Box will be involved in!